News: Taksim underpass opens – Luxembourg fuel falls – Antwerp LEZ plan – Glam group travel MFL. Weather alerts: Amber alert for heavy rain north west Denmark, and for fog, Poland Baltic coast and north Montenegro. Weather: rain north, showers in the south. Traffic: see @DE_Traffic from 09:00 BST. Istanbul. 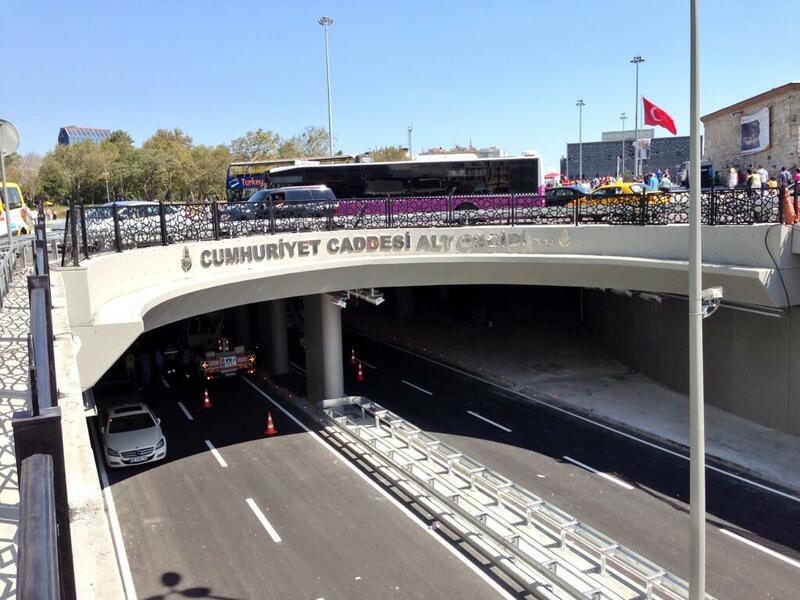 The underpass linking Cumhuriyet Avenue and Tarlabasi Boulevard, underneath the newly pedestrianised Taksim Square, opened to traffic yesterday morning. While not directly implicated in the widespread protests in the early summer, the new tunnel is obviously a central part of the square’s redevelopment plan. However, the highly controversial shopping mall at Gezi Park has now been cancelled. Meanwhile, students at ODTU University in Ankara clashed with police over construction of a new road through a forested part of the campus last weekend. Sympathetic protests broke out in other places around the country, including Taksim, on Tuesday but all has been calm since. See www.gov.uk/foreign-travel-advice/turkey for the latest. Photo via @LeighTurnerFCO. Luxembourg – presumably as a result on lessening tensions over Syria, fuel prices have fallen says wort.lu. Diesel now costs €1.244/l, unleaded 95 is €1.331/l and unleaded 98 €1.386/l. Both Italy, Portugal and Turkey all announced fuel price rises due to the Syrian crisis last week. Will they now fall too? According to figures released last night by Dutch touring club @ANWB, one litre of unleaded 95 sells for €1.70 in France, €1.67 in Belgium and €1.37 in Luxembourg. update: prices in Turkey have also been cut today, by 0.12TL/l. Unleaded 95 now costs €1.79 in Ankara and €1.80 in Istanbul. Glamorous group travel. 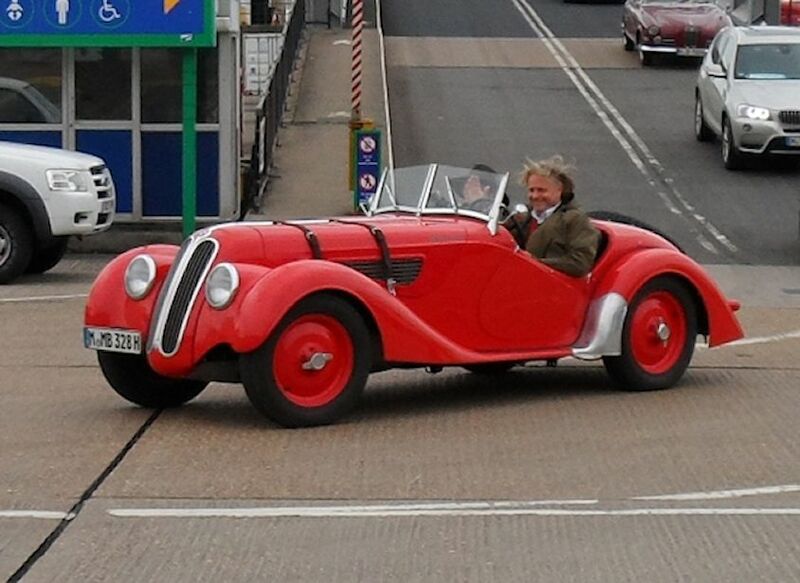 MyFerryLink Calais-Dover hosted a group of German BMW enthusiasts enroute to Goodwood this weekend, including this rather nice 328. So far so good but it did catch our eye on the accompanying press release that MyFerryLink provided ‘a private area on board the ship and tailored menu options’. For more info email groups@myferrylink.com. Belgium – despite Brussels rejecting the idea last year recently for being ineffective, second city Antwerp will create a Low Emission Zone (LEZ) from 2016. Cars over fifteen years old will be banned from the city centre east of the River Schedlt while those between 10-15 years will need a pollution trap. Authorities say particulate air matter should be reduced by 41% says deredactie.be. The system will be policed by number plate recognition cameras and could be a pilot for other schemes around the country. Gent has similar plans. Meanwhile, from mid-2014, Amsterdam authorities will refuse parking permits to diesel cars built before Jan 2005 and petrol cars built before July 1992 says DutchNews.nl. Romania. After initial reports that a woman shot a man in the head during a road rage incident in upmarket Bucharest neighbourhood Dorobanti on Thursday, it has now been revealed the weapon was in fact a gas-powered pepper spray. A 21 year old woman has been arrested. The man is recovering. Belgium. Figures show the number of teenagers taking driving tests has fallen 20% in the past five years while the number of learners in their twenties has risen by 30% in the same period. Netherlands. Possibly the world’s first drive-in cherry booth has opened in Geldermalsen, just off the A15 in the centre of the country. Also, stretches of the often five lane A2 motorway currently limited to 100kph will be upgraded to the national speed limit of 130kph. A2 runs north west-south east from Amsterdam-Maastricht via Eindhoven-s’Hertogenbosch-Utrecht. The final stretch to the capital is a notorious cash cow for the authorities with hundreds of thousands of motorists caught out. And, diplomats owe €700,000 in unpaid traffic fines from the last four years according to Justice Ministry figures. The Russians are the worst reportedly. In Berlin, however the Russians are beaten into second place by the Saudis. In the first quarter 2013 unpaid fines for all diplomats totalled nearly €80k for 4,800 incidents including six hit-and-runs reports thelocal.de. Rome. An angry mix of protestors blocked Via Merulana in the city centre yesterday to complain about Mayor Ignazio Marino – aka Mayorino – banning private traffic from around the Colosseum last month. Local business says trade is suffering but residents object to the extra traffic diverted past their homes.